Was it destiny when Pamela Blair, a psychologist on holiday in Tunisia, met a heartbroken camel herder seeking advice from a stranger? The Arab spring has sprung, and now it's the Arab summer. In country after country, people buoyed by bravery and relentless in their quest for freedom are taking to the streets. No clubs, bullets, camels, water cannons, machine guns, tanks, helicopter gunships, grenades or missiles can stop them. They want governments that are responsive to them, jobs, opportunities, unfettered speech. I had seen images of them in the media but I wanted to rub elbows with the courageous, and listen to what they had to say. I got on a plane and flew to Tunisia, where the revolution was victorious, the ruthless dictator Ben Ali was overthrown, and the population is engaged in a remarkable experience in democracy. Come with me to north Africa, and get a glimpse into the little country that could. Read the full story in my recent article, Revolutionary Travel, on the Huffington Post. The last time Americans were riveted to a foreign square, it was Tiananmen, and the year was 1989. Anti-government demonstrators –mostly students and intellectuals--wanting more democracy and less autocracy filled the square in Bejing. Other protests erupted around the People’s Republic of China. In a show of force the T.V. audience will never forget, government tanks rolled into the square and gunned down thousands of demonstrators. Tiananmen Square went silent, and the subject of the massacre is still taboo in China. 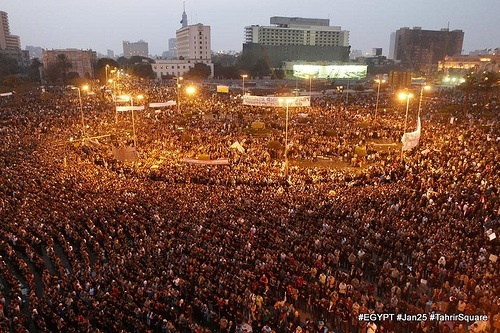 This time, all eyes were on Egypt and Tahrir Square. Once again, young protestors defiantly showed their opposition to the government and demanded that Hosni Mubarak pack up his toys of dictatorship and leave Egypt. But Mubarak played by his own rules, and when his trifling concessions were rejected, when even his offer not to run again was scorned, he pulled a Tiananmen—sending in his heavy guns to shoot indiscriminately into the crowd. The protestors refused to buckle, and the Egyptian nation mourned its innocent dead who were assassinated for demanding freedom. The world watched and wept and then rejoiced with them. The ignition key to revolution was turned on by tiny Tunisia, in North Africa. The protestors upended the 23-year reign of autocrat Ben Ali, drove him into exile and exacted the dissolution of his corrupt RCD party. In a rapid move toward democracy, Ben Ali’s minions were fired or resigned, and the young people exulted in what, for many, was the first freedom they had known in their lives. The cost of this revolution was high: as many as two hundred young lives were snuffed out. And, in a country of 10 million, everyone was affected by this horrible loss of life. There is mass mourning for the deaths, and the victims are considered martyrs to the cause of freedom. Tunisia is one of my favorite countries in the world. I have been there seven times, lived there for 6 months when I was making two films with my husband, and have a deep and abiding affection for the gentle, kind, extremely generous Tunisians.